If you're in need of an affordable and efficient wire fencing system to increase the overall security and safety of your business, our wire mesh panel systems are an ideal choice. MasterView mesh systems offer a range of security focused systems for all budgets and is fast becoming one of the most popular fencing types in the UK. 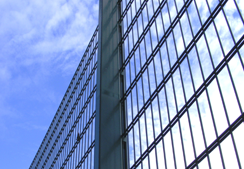 Originating from the EU, mesh systems provide some of the most secure perimeter protection without compromising on visibility through the fence. MasterView Mesh System Profile is the most economical mesh system within the MasterView range. Available in 3m wide panels which makes installation quicker and also more of an economical perimeter fencing product. MasterView Mesh System Twin Lite is available with a 200 x 50mm mesh size in line with most comparable mesh systems. With 2 horizontal wires sandwiching 1 vertical wire, this system increases cut through times, offering greater security than MasterView Profile. MasterView Mesh System Twin 868 is similar in appearance to Twin Lite, but boasts a much heavier wire configuration. Posts and fixings are also substantially more secure, which increases cut through times, offering superior security than MasterView Profile and Twin Lite. MasterView Mesh system 358 is the most secure within the MasterView range and one of the most formidable security fences available today. MasterView 358 is found where security is paramount and is the preferred choice for high security facilities such as prisons and airports. Available in Galfan only or pre-galvanised and powder coated finishes. As one of the UK's premier V mesh fencing panel suppliers, we're thrilled that we've been able to assist our customers in designing and implementing fencing strategies for their business needs. We've provided additional information about our V mesh fencing; welded mesh fencing and wire mesh panels below. If you have any questions, please feel free to contact our estimating team on 01429 852 352. MasterView Mesh System posts are Universal** and are the same for Profile and Twin Lite. This feature simplifies holding stock and recycling surplus posts from previous projects. No threaded inserts inside the posts which can spin making installation difficult. Instead, MasterView Mesh System posts are Friction drilled to give approx 5mm grip at the designated fixing points, making installation of the security fencing quicker and easier. Base-plated and cranked options are also available. MasterView Profile and Twin Lite share a Universal** MasterFix clip system. This feature simplifies holding stock and recycling surplus clips fromprevious projects. MasterFix is bespoke to Peart Fencing and the tool required to install or remove MasterFix clips are available solely from Peart Fencing. MasterView 358 and MasterView Twin 868 panels are secured to posts by means of a full length clamp bar which sandwiches the panels to the posts, further increasing security. ** Excludes MasterView 358 and MasterView 868. MasterView Mesh System panels are pre-galvanised before manufacture and polyester powder-coated to BS 1722 Part 16 (BS 6497) providing an architectural coating of 60 microns minimum. This greatly extends the life of the security fencing. MasterView 358 is available in two finishes: pre-galvanised and powder coated and also Galfan only finishes. Gates are available to compliment all MasterView mesh systems and can be tailored to suit individual site and security requirements.